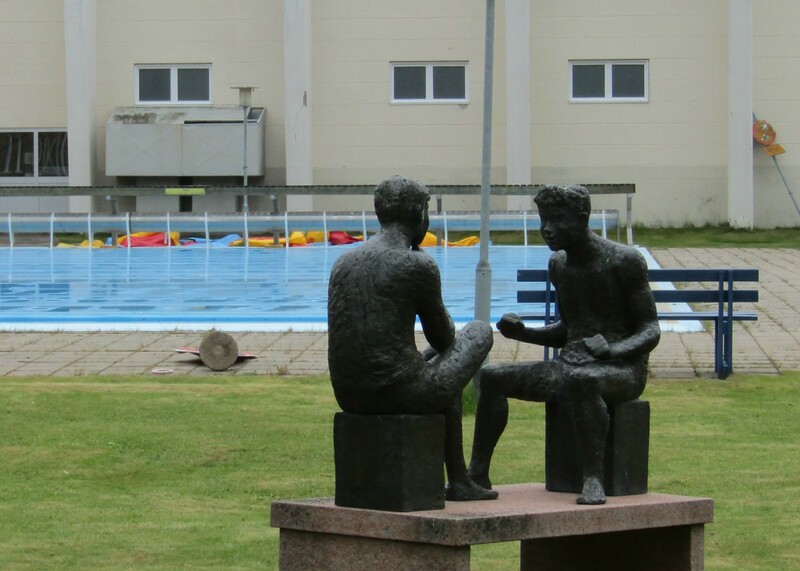 On the lawn at the outdoor swimming pool in Malmberget stands the public artwork The Talk made by the artist Elsie Dahlberg-Sundberg. The sculpture represents two people sitting opposite one another in conversation. One is passive, with legs crossed, the right elbow resting on the thigh, and the hand supporting the head. The other enthusiastic, leaning forward with legs wide apart and the fists clenched. The Talk sits in a space between Välkommaskolan, Svanparken, the indoor sports arena and the ice skating rink. It was in this sports arena that many of the strike committee meetings were held during the Great Miners’ Strike of 1969-70. Today, Malmberget is in the middle of an extensive evacuation process, and by 2032 most of the town will be gone. Houses are demolished or moved, and people leave their homes. Before long, The Talk will also be lifted and installed someplace else. People living in Malmberget understand the conditions on which the existence of their community depends. Even if having to move will be painful, it is also, for some, eagerly anticipated. The specific circumstances to living in Malmberget have provoked a desire to leave. How can you feel safe in a house that seems likely to collapse at any moment? To ensure the continued activity and expansion of the mine, people will now move, and for the most part settle in the neighbouring town Gällivare. It has evidently been easier to construct a media narrative about the evacuation and relocation of Kiruna, a city some 120 kilometers away. Malmberget sits in the shadow of Kiruna as a model city for city planning. In a conversation in this issue of the Lulu Journal, the artists Agneta Andersson, Britta Marakatt-Labba and Lena Ylipää argue that the relocation Malmberget is actually more visible and brutal. Both the built environment and the nature around Malmberget carry physical wounds, making the story of this town harder to spin into one of success and progress. The obstacles to such a narrative might in fact be too many and too glaring. Slowly we get closer to the darkness. and by looking back to see the pride of the labourers that spent most of their their lives working in underground mines. In the essay The Hole Masha Taavoniku describes the places where she grew up, whereof some are represented through a series of photographs. The essay reflects on the mechanisms of memory and the complex feelings surrounding the gradual disappearance of an entire society. It is accompanied by illustrations with the title Boom, conceived by the artist Olivia Plender in response to the text. Malmberget has a long tradition of powerful labour unions, but the strength and radicalism of the these organisations became especially evident during the miners' strike in the late 1960s, as portrayed by the filmmaker Lena Ewert. From the book Strejkkonsten [The Art of the Strike] by Ingela Johansson is an interview with the miner Ove Haarala, in which he confesses his love for working underground. Researcher Margareta Ståhl has written an introduction, Gruvfanor i norr (Mining Banners of the North), to the various banners that represent the miners’ unions in the region. Johansson's video My father worked is a montage that relates the physical labour of fathers to the history of Workers’ Educational Association, exemplified by the Ashington Group from Northumberland – an artist group consisting of miners that was widely exhibited between 1934–1984. Archival material from the correspondence between the group and Whitechapel Gallery is intertwined in the narrative. The questions we asked Andersson, Marakatt-Labba and Ylipää are mainly founded in an interest in their working conditions. What is their experience of working as artists in places where the mining industry has been the very condition for the construction of society? Societies, which now are undergoing comprehensive evacuations and infrastructural transformations. There is not one talk to be had about Malmberget. Rather, a new one starts every day. But there are attempts to portray, disseminate and reproduce stories. This issue of the Lulu Journal is one such attempt. Many thanks to all who have contributed to this issue: Agneta Andersson, Lena Ewert, Ove Haarala, Britta Marakatt-Labba, Olivia Plender, Margareta Ståhl and Lena Ylipää. Thank you for helping with imagery and research: Marie Riskilä, Gellivare Bildarkiv, Anna Storm, Södertörn University and the Swedish Labour Movement’s Archive and Library. Thanks also from Masha to Erik Galli for feedback during the writing process. *Ingela Johansson is an artist and writer. She recently participated in the Portable Landscapes exhibition at the Latvian Center for Contemporary Art in Riga. In 2013 she released the book The Art of the Strike: Voices on political and cultural labour during and after the miners’ strike, 1969~70 (Glänta produktion).